OBJECTIVE: Established in 2013 to provide every eligible senior living inside a Residential Group Home, ALF, SNF and Senior Living Community, access to a unique Wellness Program for Independent Living designed around multiple “onsite” healthcare services such as audiology, dentistry, physician house-call services and podiatry. These services benefit those who are without transportation, disabled, acutely ill or those who simply choose the convenience of onsite services provided within their community. This program is offered by EnCore Post-Acute Network, LLC, dba, EnCore Senior Care Network. HOW DOES THE PROGRAM WORK : Our Wellness Program can place a patient advocate in your community two-three days a week to initiate a deeper understanding with your residents regarding their medical needs. This will allow us to communicate and offer the best possible options of healthcare services to match their specific medical needs. 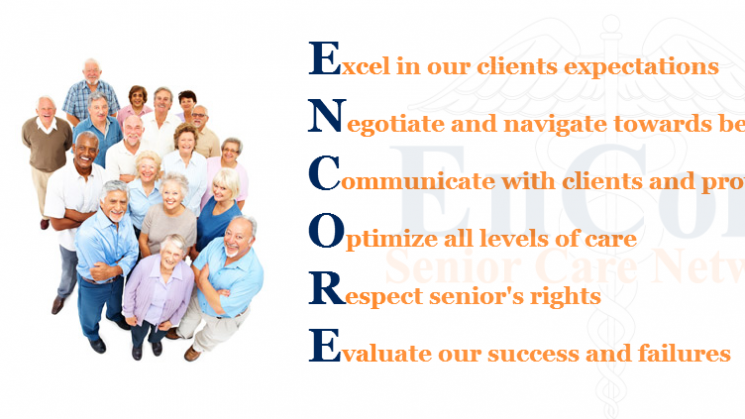 As well as placing a Patient Advocate, EnCore Senior Care Network, coordinates physician, PA-C or nurse practitioner services to conduct scheduled visits at your community for transitional and important "Core" health services. Also, we are networked with a number of post-acute providers such as Assisted Living Facilities (ALFs), Long-Term-Acute-Care Hospitals (LTACH), Rehabilitation Hospitals, and Skilled Nursing Facilities (SNF) in Dallas/Fort Worth. WHAT MAKES THE ENCORE WELLNESS PROGRAM DIFFERENT: Physician Consistency - Having a physician rotate within the community will allow the residents to see a familiar face on a regular basis, thus allowing the patient’s trust in the physician to increase. Patient Advocate Placement – The Advocate builds community trust toward healthcare options ultimately allowing us to better serve your community better. Network Growth – Daily we are adding physicians, mobile medical services, and community programs to our network based upon residential surveys and individual senior feedback. Program Design – Our is designed to add value to a senior community and provide residents unlimited services to age in place indefinitely.